It's <a href="http://www.inhabitots.com/green-must-haves-for-back-to-school/">back to school</a> time and we are already thinking about how to prepare healthy lunches. I like to make my daughter's <a href="http://www.inhabitots.com/vegetarian-school-lunch-box-ideas-for-kids/" target="_blank">lunch menu</a> a week in advance so I know what to buy when out shopping. This way we cut back on waste and don't spend a lot of money on prepackaged snacks. Children only get 15-25 minutes to eat their meals, so a large lunch usually ends up in the trash or coming back home. That's why you should pack small, yet healthy and filling <a href="http://www.inhabitots.com/6-great-gluten-free-lunches-kids-will-love/" target="_blank">lunches</a> that will get them through the day. 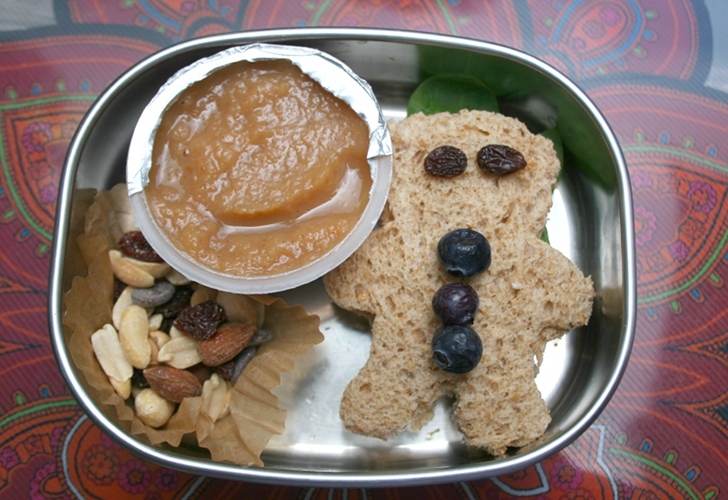 Check out a week's worth of organic <a href="http://www.inhabitots.com/green-review-planetbox-lunch-box/" target="_blank">bento box</a> meals your child is sure to love! 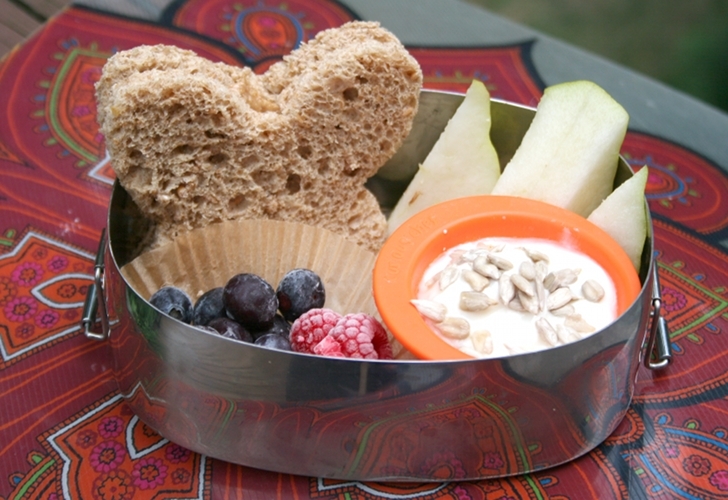 <h2>Bento Box Lunch: Day 1</h2> <ul> <li>Almond butter and honey sandwich</li> <li>Vanilla yogurt with sunflower seeds</li> <li>Sliced Pear</li> <li>Berries</li> </ul> Using a cookie cutter, press a fun shape into 2 slices of whole wheat bread. Spread almond butter on 1 slice of bread and honey on the other, then press together. In a small container, add plain or vanilla yogurt and top with unsalted sunflower seeds. Slice a pear in half and then into 1/4ths to dip into the yogurt or eat plain. Using recyclable or reusable cupcake liners, place some fresh berries inside. <h2>Bento Box Lunch: Day 2</h2> <ul> <li>Spinach and cheese sandwich (meat optional)</li> <li>Cinnamon applesauce</li> <li>Nuts, cranberries, rasins</li> </ul> Using a cookie cutter, cut through 2 slices of whole wheat bread and add spinach, cheese, and if you'd like turkey, chicken, or ham. You can use a container to add applesauce or use an individual pack. Be sure to have your child bring home the container if they do not recycle at his school. Using a reusable container or recycled cupcake liners, add nuts and fruit. 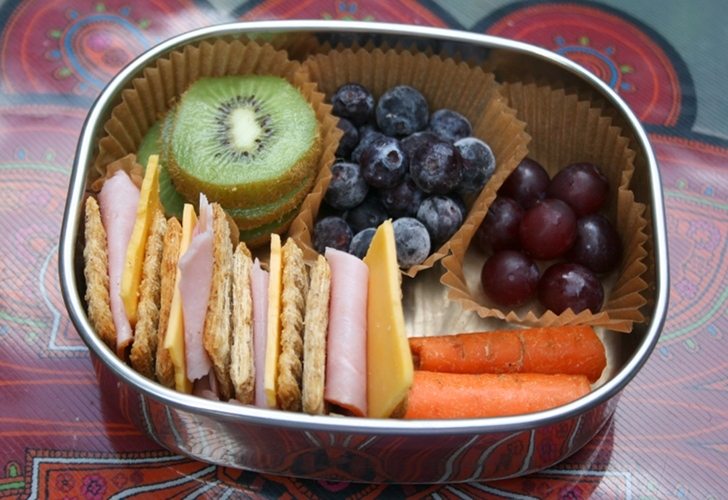 <h2>Bento Box Lunch: Day 3</h2> <ul> <li>Ham and cheese whole wheat crackers (or swap in a veggie meat alternative and/or soy cheese)</li> <li>Carrots</li> <li>Grapes</li> <li>Kiwi</li> <li>Blueberries</li> </ul> This is a very easy bento box! Take a cracker and put ham and cheese between and add a bottom cracker, continue until you have 4. If you're a vegetarian or vegan, try Yves soy-based deli slices or Tofurkey slices instead. In case their juice drains, use reusable containers or recycled cupcake liners for your fruit. Then cut a carrot in half and place in box. 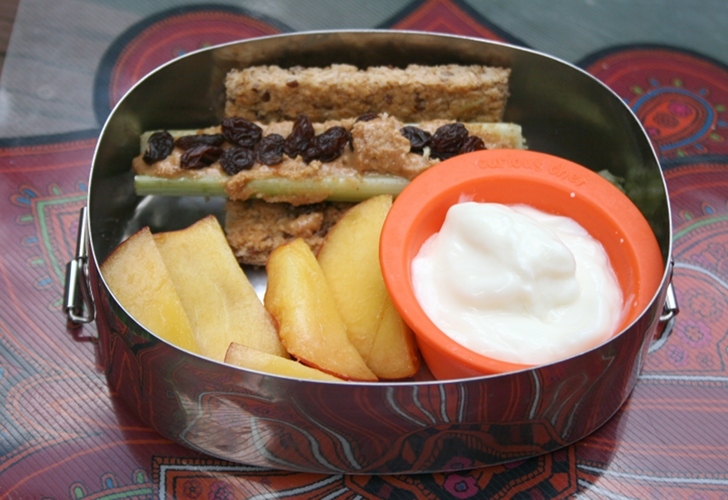 <h2>Bento Box Lunch: Day 4</h2> <ul> <li>Granola bars</li> <li>Vanilla or plain yogurt</li> <li>Peaches</li> <li>Ants on a log (celery, peanut butter, raisins)</li> </ul> You can use homemade granola or granola bars to dip in the yogurt. Slice a peach and place in box. I leave the skin on and my daughter peels off or eats around it. Cut a celery stalk in half, then add peanut butter and raisins. 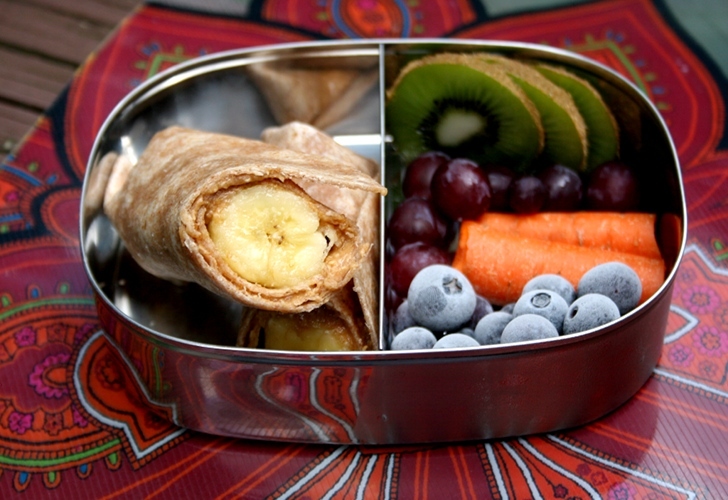 <h2>Bento Box Lunch: Day 5</h2> <ul> <li>Peanut butter banana whole wheat wrap</li> <li>Kiwi</li> <li>Carrots</li> <li>Grapes</li> <li>Blueberries</li> </ul> Cover a whole wheat tortilla shell evenly with peanut butter. Then add a whole banana and roll into a wrap. On the other side of your box, add fruit and vegetables.